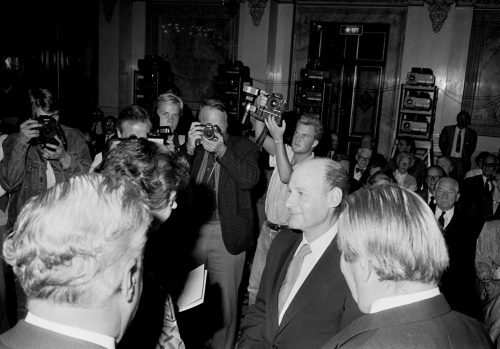 The Hasselblad award was presented for the fifth time on Monday 23 September 1985. The award winner, Irving Penn, New York City, received the award from Her Royal Highness Princess Désirée, at a ceremony at Börsen, the former stock exchange in Göteborg. The award sum was USD 20,000. In conjunction with the ceremony an exhibit of the award winner’s photographs was displayed at Börsen. Irving Penn has long been recognized as one of the world’s most distinguished practitioners of editorial, advertising and fashion photography. Since his photographs first began to appear regularly in Vogue magazine in the 1940s, his work has been characterized by its technical elegance, its demanding standard of style, and its sensitivity to the quality of light. Irving Penn is one of a very few photographers who possesses the capacity to produce masterful artistic and commercial photographs.